Microsoft Azure : Create Resource Group & Availability Sets Step By Step Tutorial With Training Video. ~ Microsoft Azure Step By Step Tutorials And Free Online Training Videos. Microsoft Azure Step By Step Tutorials And Free Online Training Videos. Free Microsoft Windows Azure Step By Step Tutorials With Online Training Videos To Learn Install Deploy Design Implement Architect Azure Cloud Solutions. Microsoft Azure : Create Resource Group & Availability Sets Step By Step Tutorial With Training Video. This tutorial demonstrates free step by step procedure how to create a resource group and availability sets in azure cloud. A Resource Group in Microsoft Azure Cloud Infrastructure is termed to be a container which contains resources of related entities that we deploy. All the resources we deploy can only be a part of any one resource group. Resource Group can handle each and every resource individually and seperately. One can add or remove a resource to or from a resource group at any given point of time. Also you can move a resource or group of resources from one resource group to another resource group. Resources created in different regions can reside in one resource group. For example a resource from Group ABC can interact with other resources in Group XYZ. The metadata of all resources is stored with its respective resource group. A location of the resource group determines the location where the metadata is stored. The resources inside a resource group share a common lifecycle. At present there are no limits to the number of resources in a resource group. We cannot rename a resource group. Availability Sets in Microsoft Azure Cloud Infrastructure are used for high availabilty of many virtual machines in the same application tier. It is necessary to have minimum 2 virtual machines in an availability set for redundancy of those virtual machines. This best practise ensures at least one VM will be available in case of host failure which have hosted the virtual machines. Virtual machines must be deployed into availability sets according to their workload or application tier. Every virtual machine in the availability set will be given a fault domain and an update domain. Each availability set with 5 non configurable update domains and 2 fault domains indicates the groups of VM's and the physical host that can be rebooted at the same time for host maintenance planned downtime. Fault domains represent which virtual machines will be on separate physical hardware for redundancy thus reducing the impact of hardware failures and power interruptions. A virtual machine can be added to an availability set at the time of its creation or later. Free Step by Step Install Procedure for creating Resource Group in Microsoft Windows Azure Cloud Infrastructure using Azure Resource Manager ARM. Step 02 : Click on Resource Groups in the left pane. Step 03 : Click on Create Resource Group. Resource Group Location and Click on Create. Resource group is successfully created. Free Step by Step Install Procedure for creating Availability Sets in Microsoft Windows Azure Cloud Infrastructure using Azure Resource Manager ARM. Step 01 : Search for Availability Sets in to Microsoft Azure Market Place. Step 02 : Click on Create Availability Sets. Availability Sets is successfully created inside Resource Group. 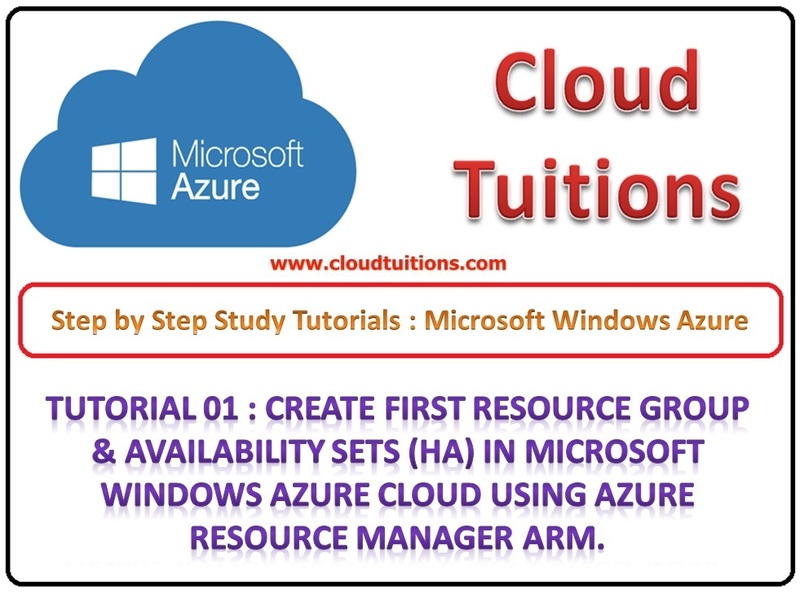 Watch Step by Step Microsoft Azure Free YouTube Video Tutorial on How to Create Resource Group and Availability Sets in Microsoft Azure Cloud using Azure Resource Manager ARM. Microsoft Azure : Create VNet to VNet VPN Connection Step By Step Tutorial With Training Video. Microsoft Azure : Create Site to Site VPN Connection Step By Step Tutorial With Training Video. Free Microsoft Azure Online Step By Step Tutorial & Exam Certification Training Videos. Microsoft Azure : Create Point to Site VPN Connection Step By Step Tutorial With Training Video.